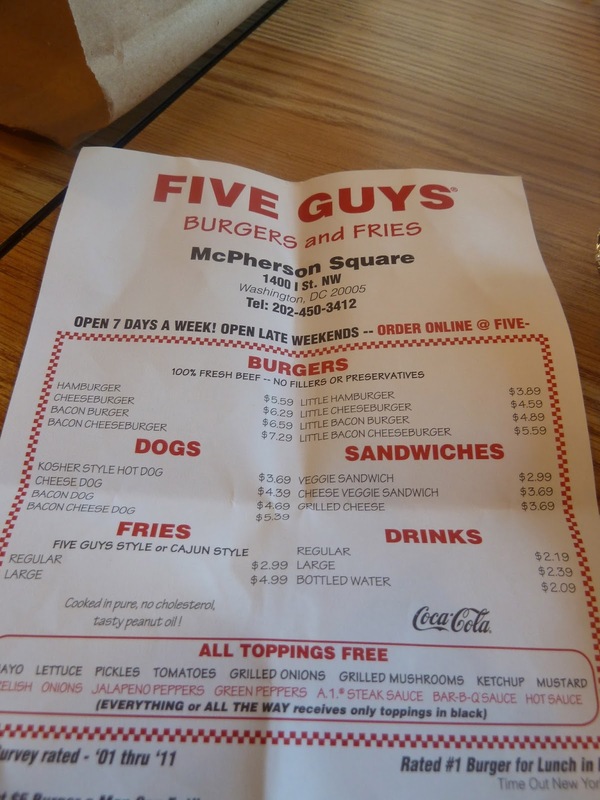 About 1 block from the hotel I saw a sign on a corner cafe called Five Guys. It looked like a hamburger joint so I decided to investigate this place further via the internet. My good friend Mr Google was of great help as usual! 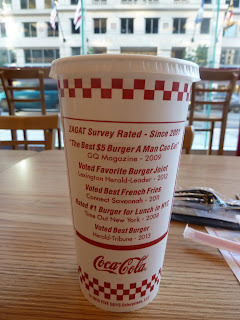 Based on what I had read it looks like Five Guys is a rather popular hamburger joint and has locations all around the US. 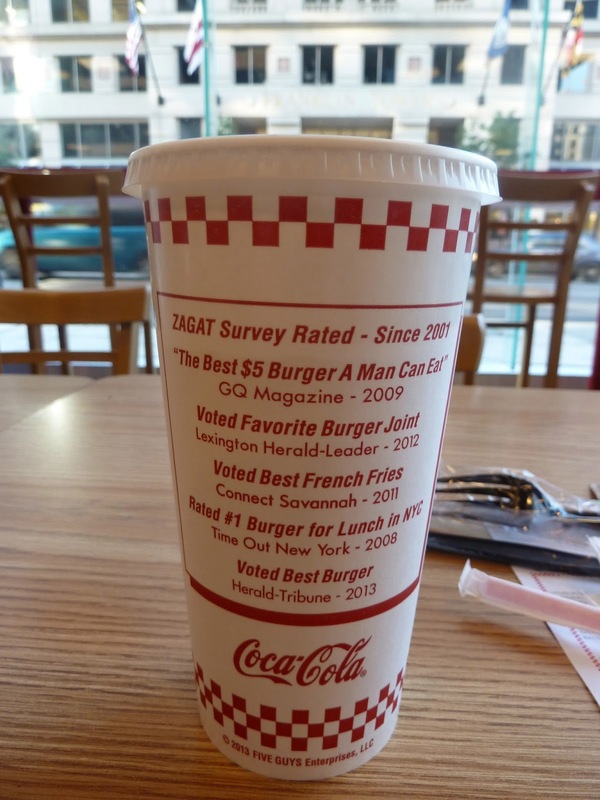 It has been voted as having the best burgers from various states around the US including Washington DC. So one night I decided to have a low down hamburger dinner there. For burgers, the way it works in this place is you have to decide if you want a Hamburger, Cheeseburger, Bacon Burger or Bacon Cheeseburger. Then you can choose the toppings to go with the burger. All toppings are free of charge. Mayo, Lettuce, Pickles, Tomatoes, Grilled Onions, Grilled Mushrooms, Ketchup, and Mustard. Relish, Onions, Jalapeño Peppers, Green Peppers, A1 Steak Sauce, BBQ Sauce, and Hot Sauce. I decided to have a Hamburger with Tomatoes, Grilled Onions, Pickles and Ketchup. I also ordered a Small serving of Fries (Five Guys Style). It turns out that the Five Guys Style is that the fries have the potato skin still on. A rather rustic style but not one that is off-putting. I didn't mind it at all. My burger was a lot meatier than I anticipated. I had thought there would be 1 layer of beef patty but it turned out there were 2 layers of beef patties. With dollops of ketchup on my fries, it turned out to be quite a full meal. The burger itself was quite good and quite tasty. Not the best I have had but not too bad at all. The next morning I decided to have my breakfast here and I chose the BLT Sandwich. The bacon was cooked oh so very crispy. I couldn't taste any fatty oil in it so it felt like I was eating a healthy sandwich for breakfast even though I knew I wasn't. But I did enjoy it! That sandwich kept me going for the rest of the day until dinner time.